Anyone have any tips or tricks to getting this fella out? Already broke a bit trying to unscrew it. Have you tried heating up the casting (very hot) letting it cool and reheating a couple of times? Also PB Blaster seems to work pretty well to help loosen stuck bolts- would try that after the heating approach. Last resort would be drilling it out and re-tapping. I second the PB blaster - Give it a few days, spray it a couple times a day. Patience is the key... got a bit more of it as I got older!!! It has soaked for a week at this point with periodic resprays. I should buy stock in whoever makes PB Blaster. This stuff is magic. Heat is next. I was trying to avoid buying a torch. Hey, the whole point of these projects is to give an excuse for buying more tools, right! Ok, at least half the point. At my age, the spouse has said "no more tools!" so I am relying on good friends that have the tools (and the skills) that I don't have. Heat plus PB Blaster should do the trick. As stated above, patience is also a virtue for sure. Your first post indicated you broke off a bit. The top part that has the slot for your screwdriver? Mine backed out after a couple of weeks of PB soaking. Occasionally, I'd tap the engaged screwdriver to jar the set screw while it was soaking. Then I'd try to twist the screw in BOTH directions until I got movement. More PB while doing this to work it down into the threads. Mine backed out. 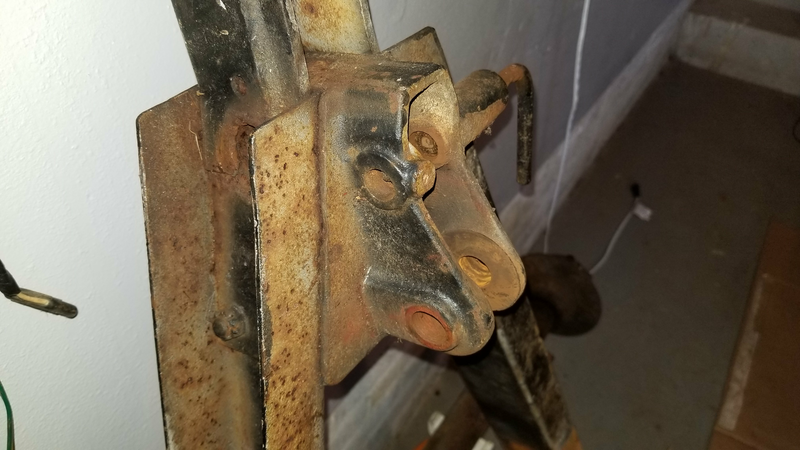 If yours is broken off at the top and the bottom is still stuck, it may need to be drilled and backed out or the hole re-threaded. I believe I'm reading correctly that it's 1/4"-20 (set screw 3/4" long). I did not even know there was a set-screw there. What is its purpose? Seems like it would be a pain to loosen everytime we wanted to raise or lower the leg. The spring on the pin normally keeps the pin engaged, and the leg from changing positions? The landing leg pin is actually a straight part. But it seems to be bent at 90 degrees for comfort and ease of use. In order to remove it, you have to bend it straight or cut the bent part off and push it through that hole. Replacement requires that set screw to be gone. Though I suppose once the new one is in place and bent 90 degrees, there's no need for a set screw there. Oh . . . makes sense now . . . the set-screw does not clamp against the pin, it is to keep the pin from travelling too far under spring pressure. 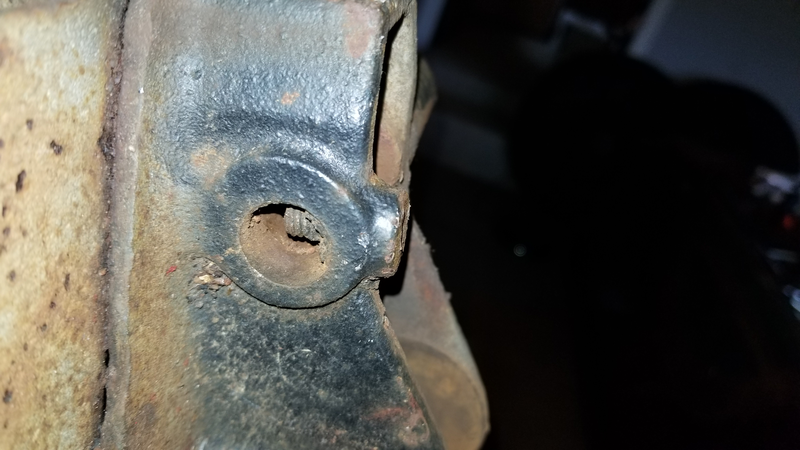 I need to replace the pin on one of my trailers, it is very sloppy, and the spring is weak. I have never taken the time to see what it involved. I normally try heat and if that doesn't work drill and tap always does. In this case I think I would leave it as is unless it really had to come out.